Who Should We Eat? Review - No Seriously, Who Should We Eat? — GamingWithSwag.com - Dads By Day, Gamers By Night. Dec 1 Who Should We Eat? Review - No Seriously, Who Should We Eat? Quick Glance: Who Should We Eat? 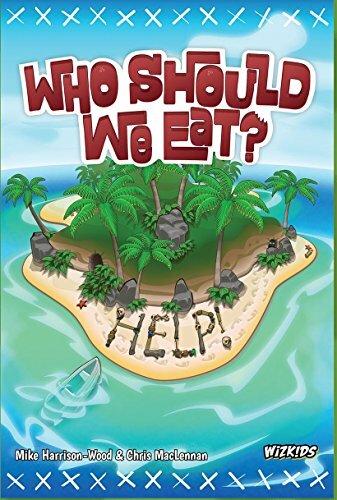 “Who Should We Eat” is a mostly co-operative card game. A typical game round has four or five sections (depending on how well things go during the day). A game will last until either the survivors have built a raft, and made it through a day without eating anyone, or until any one of a number of failure barriers are met. A turn starts with Morning Phase. Morning Phase is simply where players draw their cards, and place which cards they intend to play during a turn. Each player chooses one card that will definitely get played (Play Card), and one that may be played should the need arise during Trial Phase (Keep Card). Next up is Afternoon Phase. The first thing that goes on in Afternoon Phase is that the leader chooses a “Quest” for the group from a set of 3 cards drawn from the Quest Deck. These quests usually have one good benefit for the group, but then a negative effect for the player that draws the shortest straw. Players then go around in turn order playing their previously chosen Play Card, and adjusting the various condition tracks. Evening Phase is where the team has to face the choices is has made during the day. First off, the sanity meter goes down by 2 points. This is standard, regardless of how many survivors are still in the group. If the sanity meter ever runs down to 0, the survivors lose immediately. Did I ever tell you about the time when I was a pantsless but armed farmer that led a tragic life? Next, the survivors have to eat. Each survivor eats 1 food per turn. At this point, if the survivors have all eaten, and the food meter is at 0 or above, the team has succeeded at the day and moves to Salvation Phase. If not, Trial Phase begins! Trial Phase is where this game gets real. During this phase, the team collectively chooses who becomes dinner. In vague turns, the rule book suggests playing this section up, sort of like tribal council on Survivor. I wish it went into more detail when it tells the leader to “set the rules” for the trial…but you just have to make this up yourself. I prefer a more hectic “everyone just yell and point until a decision is made.” But if you are the leader, and you want each team member to wax poetic about why they should stay, you can do that as well, you’re the leader. During this trial phase, especially if one player sees things going poorly for them, a survivor can expose a knife card from their keep area, and begin a knife fight. I feel like the knife fight rules as printed in the rule book don’t make a whole lot of sense. For example, if only one person brandishes a knife, the target gets a chance to defend themselves by showing a Shield card in their keep area. This ends the fight, and the trial resumes. That’s fine, and makes total sense. A 6-player game in progress. This one takes up a fair amount of space. However, if more knives get shown, then no shield cards can be revealed, and all attackers and targets face off in a giant Draw Straws event, the short straw is eaten. I don’t think I like the fact that the targets get dragged into the fight, even if they were smart enough to protect themselves. I think I would prefer it if all the attackers were just thrown together. Also, I kind of wish there was a knife fight mechanic other than drawing straws. That seems anti-climactic. To me, the knife fight is the weakest part of the game, which is a shame, because it has the potential to be the most fun part. Eventually, either through knifing or through voting, a survivor is eventually killed. Sometimes, a body didn’t offer up enough meat, and the trial phase must be repeated. Once the food situation has improved, the remaining survivors go on to Salvation Phase. Depending on if there was a trial or not, the remaining survivors check to see if they’ve successfully completed the raft. If not, the must prepare for another day. If there was a trial, this phase is basically skipped. No salvation for the wicked. The next morning, the player(s) that were eaten the turn before return to the game…as ghosts. They will draw cards from a different deck, and play cards that will haunt the remaining survivors, and screw them up in other ways. The more survivors killed, the more ghosts that show up. If the sanity track ever reaches 0 now, the ghosts win the game. The ghosts also win if the survivors ever run out of quest cards, or if a trial is started and there are only 2 survivors left. For a light game like this, the rule book is kind of a mess. There are only 6 pages, but there are several points where key concepts aren’t explained fully (such as the rules for trial) on the page that they are brought up - causing confusion. Also, I must mention that the knife fight rules aren’t totally logical. There are a couple of examples, but they don’t cover the various situations that have come up in ways that satisfy me. I feel weird saying I love cannibalism as a theme, but I do. I love the juxtaposition of a dark theme with a cartoonish presentation. Set up isn’t too bad, but does take a few minutes for such a light game. Each player gets a character and a personality card. Just deal these out randomly. There are 5-6 small decks of cards that need to be shuffled and placed in specific locations. There are also three boards with markers that need to be laid out. Maybe 5-7 minutes total set up time. Tearing it down should be similarly simple if you’ve kept things organized during the game. The components do the job, but aren’t great. The cards are very glossy, and they don’t feel substantial. The game does sport bold colors with clear icons that help make things a bit easier. Many of my cards have numerous scratches and gouges after just a few games. I really appreciate that they gave a deck of cards for the straw drawing mechanic, as well as cardboard bamboo straws. While the cardboard straws look nice, my groups have found them far too difficult to use effectively. The main boards are fine, although I really dislike the snaking food track. It’s so easy to move the marker to the wrong place, and not notice it. I also have no idea why the player cards all have the same backs. There are three different decks, and never are they combined in any way. You can’t even bluff discards by sending them to the wrong deck. It may seem minor, but it caused a great amount of confusion, and added quite a bit to the set up time because inevitably someone collected all the cards and shuffled them together. We're having a few friends for dinner. “Who Should We Eat” isn’t quite a social deduction game like Werewolf or The Resistance, but it is clearly aimed at that market. It actually reminds me a bit of Betrayal at House on the Hill, in that everyone is working to a common goal, right up until the moment when someone…most likely without their knowledge, becomes a traitor to the cause. You really have to have the right group for this game. My main group had fun with the knife fights, and we had moments of real tension during some straw draws. However, we didn’t find the underlying game compelling enough to want to play again. Even though there are a good number of characters and traits, they don’t make each game feel very different from one another. All that being said, if you have the kind of group that fervently loves “Werewolf”, “The Resistance”, “Coup”, and all the other myriad social deduction games… “Who Should We Eat?” will be a perfect fit for your library of games. Nov 30 Oregon Trail: Hunt For Food Review - Don't Go Hungry!